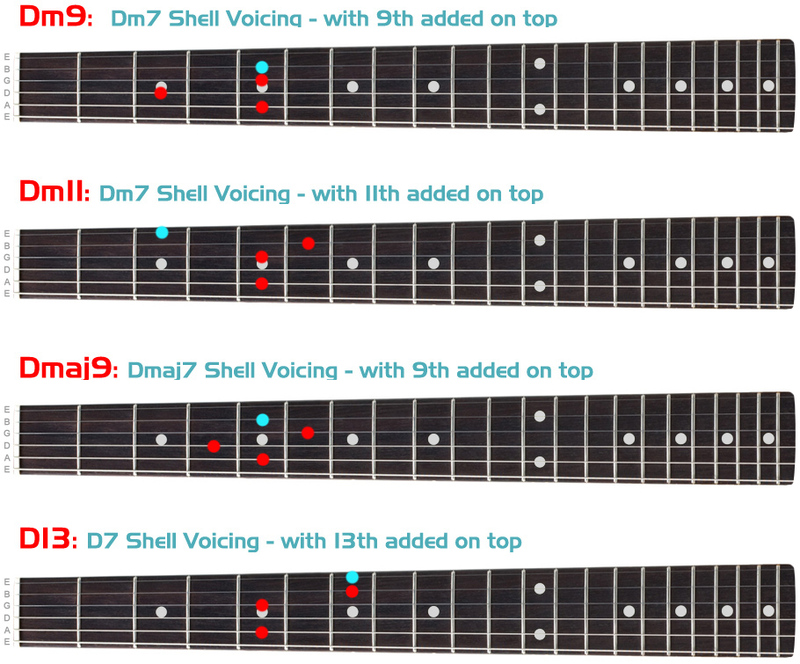 Now, here is the aspect of shell voicings that I think you'll find the most useful. They make a fantastic starting point for building our chord vocabulary. Due to the fact that they are constructed from the minimum number of notes needed to produce the basic sound of a chord, there's a lot of room to expand them by adding other voices into the basic shell. Let me give you an example: Let's say we take our basic Dm7 shell voicing with the root on the 5th string. This would give us the notes, D (root), F (minor 3rd) and C (the minor 7th). If we were to add the note E on the 5th fret of the B string to this basic chord we'd end up with a Dm9 chord! Cool! Let's add the note G instead. There's one on the E string at the 3rd fret. This would give us a great voicing for a Dm11 chord. Even better, if we now take the 3rd up an octave so it resides at the 6th fret of the B string, then the chord sounds even more cool! This idea or method for building chords has been outlined below and in the video for various chord types using the shell voicings as a starting point. It does require you to have a reasonable scale and chord construction knowledge which you can get from this very site. However, once you understand these elements you'll be building all sorts of chords from these basic shell voicings! Good luck and ask any questions in the forum!